NEW ORLEANS (AP) — With every Anthony Davis put-back dunk, reverse alley-oop jam, step-back 3-pointer or game-sealing block in the playoffs, the New Orleans Pelicans take a step closer to becoming the NBA's next small-market success story. CLEVELAND, Ohio -- You may not care what Kyrie Irving does with his free time now that he's the enemy, but we're also an entertainment site, so here's your first look at the "Uncle Drew" movie. Yes, somebody had the bright idea to turn the grumpy former basketball legend who first surfaced in a Pepsi commercial into a full-length feature film. SAN MARCOS, Texas (AP) — Freshman Shelby Adams led five Texas State players in double figures with a career-high 17 points and the Bobcats beat Division III McMurry 100-50 on Wednesday night. Adams was 5-of-7 shooting and added a career-best five steals. It was Texas State's highest-scoring game since a 103-76 win over Houston Baptist on Dec. 3, 2011. MONTGOMERY, Ala. (AP) — The sign above Reggie Miller's head says "Golden Shears & More." There's an emphasis on the "more" - and not just because of the new downtown barbershop's spa or billiard room. INDIANAPOLIS (AP) — Children's Museum of Indianapolis is planning bronze sculptures honoring more than a dozen sports stars as part of its new $38.5 million sports exhibit. The museum says the statues will form an "Avenue of Champions" as part of its Sports Legends Experience that's scheduled to open next spring. SAN ANTONIO (AP) — Manu Ginobili is returning for his 16th season with the San Antonio Spurs. The Spurs re-signed the 40-year-old Argentine guard Thursday. Terms of the deal weren't disclosed. Ginobili will become the eighth player in NBA history to spend his entire career with one team and play at least 16 seasons, joining Tim Duncan, Tony Parker, Kobe Bryant, Dirk Nowitzki, John Stockton, Reggie Miller and John Havlicek. It is not uncommon for young athletes to emulate their favorite players. 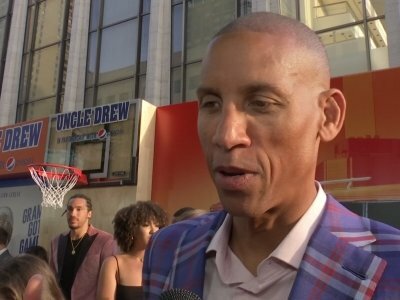 I know I always looked up to Reggie Miller by hitting the 3-pointer from the wing or practicing my sky hook like Magic, despite my short and stubby stature. But recently an entire local high school team is starting to emulate one of their favorite college basketball teams. So there is no need to head over to Spokane to get a taste of Gonzaga basketball. INDIANAPOLIS (AP) — Tamika Catchings scored 16 points in her final regular-season WNBA game and the Indiana Fever locked up the No. 5 playoff seed with 83-60 victory over the Dallas Wings on Sunday. Catchings received a standing ovation when she left the game with 1:33 left in the fourth quarter. She played all of her 15 seasons with Indiana, finishing her WNBA career second in points, first in rebounds and first in steals. With the youngest roster in the league, the Milwaukee Bucks are hoping the addition of two veterans can help with their problems shooting from long distance. Free agents Jason Terry 38, and Steve Novak, 33, are expected to be signed as soon as Monday, league sources said Friday.